Our experience and dedication to quality allows us to advertise the fact that we work with most major insurance carriers, and when we say “our family, serving your family.” we really mean it: Joe and Steve, and their sons Mike and Ron, are here to help facilitate your repair. 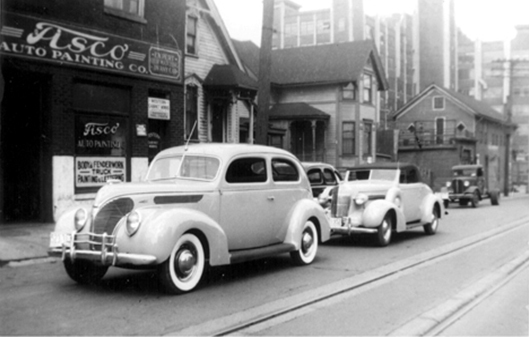 Your single source for all your collision and refinishing services since 1931. From estimate to deliveryof your freshly repaired vehicle, you can expect state-of-the-art efficiency and a quality experience. Our staff ensures you’re receiving nothing but the best from auto service to customer service.This Website offers an overview of our capabilities, our commitment, our philosophy, as well as somepretty darn cool pictures to enjoy! 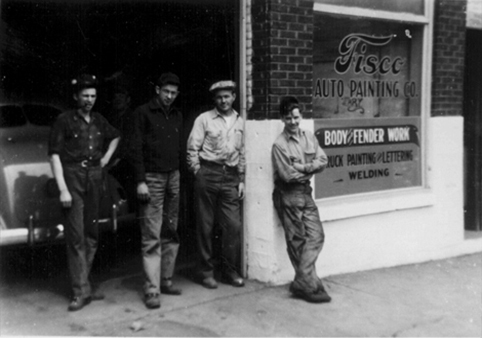 Fisco Auto Body, where we put our name On the Sign and On the Line. Yes, your vehicle will be safe and secure in our facility throughout the repair process, however, we do ask that all personal effects be removed prior to drop off. At Fisco Autobody, we only use new and used factory replacement parts or quality aftermarket parts and PPG Envirobase paint for your repair. In addition, our technicians are all educated and trained in their specific area of expertise. With over 75 years of consistent service and quality, Fisco Auto Body will be happy to negotiate with your insurance carrier for an accurate settlement for your quality repair. 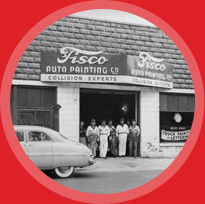 Fisco AutoBody is proud to be the oldest auto body repair shop in Franklin that has have 3 generations of Fiscos serving the collision repair and refinishing needs of so many. 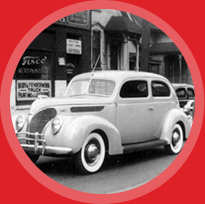 Our deeply planted hometown roots and well-established reputation is a great indicator that your repair is in good hands! We employ I-CAR trained technicians and are honored to be a member of the Automotive Repair Association. 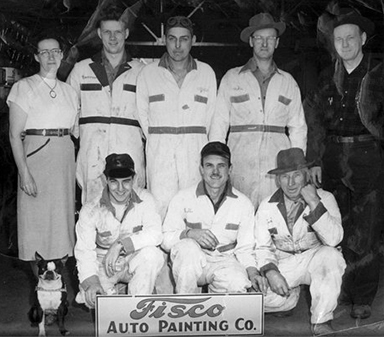 This commitment to training, combined with our state-of-the-art facility, are just two more reasons so many choose Fisco Auto Body. Our Experience and dedication to quality, allows us to advertise that we work with most major insurance carriers. When we say, “our family, serving your family”, we really mean it. Joe, Steve, and their sons, Mike and Ron, are here to help facilitate your repair. We truly understand that being involved in an accident is not a pleasant experience, however, The Fiscos will do everything possible to make your repair process as easy and painless as possible. Don’t allow the possibility of an additional mishap by choosing the wrong repair facility. 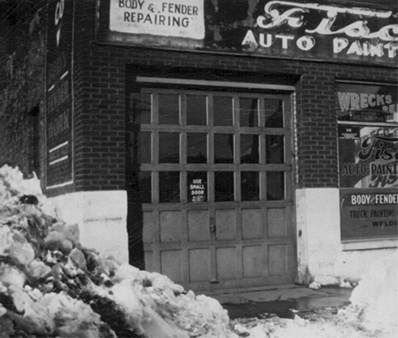 With over 7 decades of experience, here are some important pointers and tips for our customers. You have the right to choose your auto repair shop. Your insurance company cannot require you to go to a particular repair facility. You should choose a repair shop that has “state-of-the-art” equipment and qualified technicians. 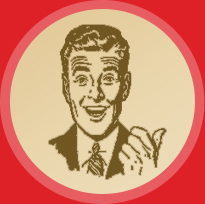 Some insurance companies request that you visit their drive-in claims center before having your car repaired. Whether you choose to do so is your choice. You may prefer to leave your car at your collision repair shop and request that the insurance company send an appraiser to that facility. There is no legal requirement that you obtain more than one estimate for your vehicle repairs. Use a repair shop that offers a written warranty. Differences in repair estimates and insurance estimates are common. A lower estimate may not include all necessary work or updated parts pricing. If you are unsure why one estimate is different from another, feel free to ask your customer service representative at your repair shop. Verify that your repair shop will be using the parts to which you are entitled. This will vary according to your insurance policy. Many people are happy with the cost of their insurance until they need to use it after an accident. Cheap insurance is usually a good deal only if you don’t need it. Your collision repair shop should negotiate your claim on your behalf with the insurance company. If your car is unsafe to drive, do not drive it. If you’re unsure, check with your repair facility. Your car is one of your largest investments. Preserve its value and your safety by having it repaired professionally.